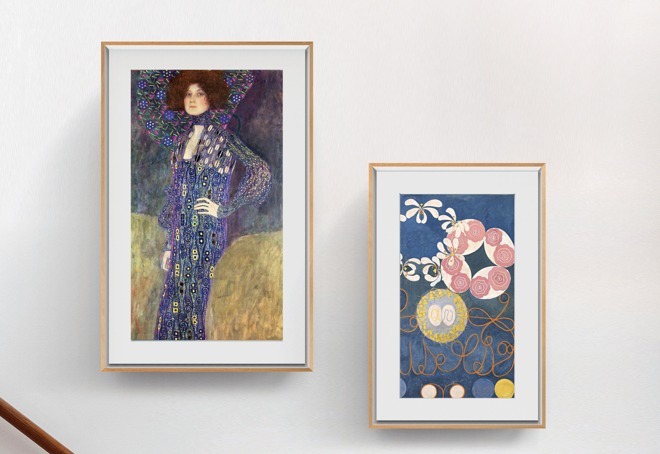 The third-generation of the Meural Canvas smart art frame will be the first release produced by Netgear following the company's acquisition in August last year. The Meural Generation 3.0 Canvas will be offered with four different frames and in two different sizes, consisting of 27-inch and a new 21.5-inch version. The new model is more power efficient compared to previous versions, as well as incorporating a new display panel, a new light sensor location that improves the light detection, more easily accessible USB and SD card ports that can be used without removing the device from the wall, and optimized gesture controls. While it contains a number of enhancements to the hardware and software, it continues to offer users access to a library of 30,000 curated images from museums, artists, and other content partners. At can be selected through the companion app, which is then displayed on the digital canvas via its Wi-Fi connection. Pricing for the digital frame has yet to be advised, but it will have a "more accessible price tag." The Orbi Whole Home Wi-Fi System with Built-In Cable Modem (CBK40) is a tri-band router that can be used to set up a mesh Wi-Fi network in a home. What's more, the router includes a 32x8 DOCSIS 3.0 cable modem that is compatible with all major cable Internet providers, and is designed to work out of the box with Xfinity, Spectrum, Cox, and others. Netgear suggests the router will pay for itself in short order, by eliminating some of a cable subscriber's equipment leasing fees. Capable of covering up to 4,000 square feet, the system is capable of providing up to 1.4Gbps of transfer rates using channel bonding. For wired connections, the router also includes two Gigabit Ethernet ports. The accompanying Orbi Satellite has four high-performance antennas with high-powered amplifiers, implicit and explicit beamforming, and is MU-MIMO capable for handling streaming for multiple devices at once. 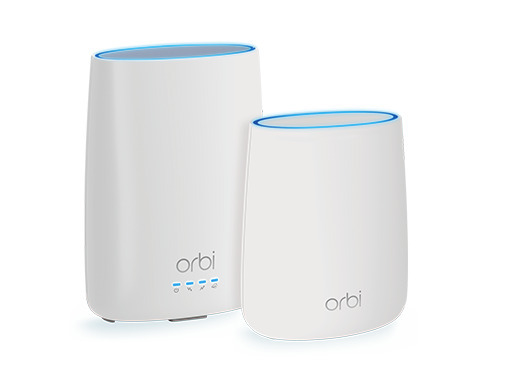 The Orbi Whole Home Wi-Fi System with Built-In Cable Modem is available now, priced at $349.99. 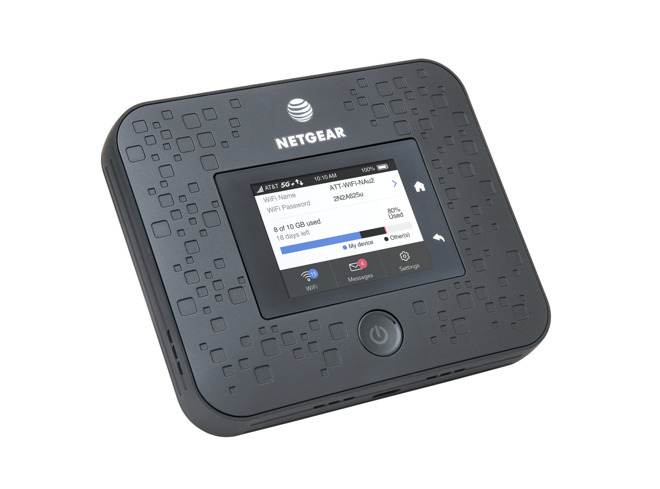 The Nighthawk 5G Mobile Hotspot, made exclusively for AT&T Mobile's 5G mobile network, will be the "world's first standards-based millimeter wave mobile 5G device." Powering the hotspot is the Qualcomm Snapdragon X50 5G modem, itself described as the first commercial 5G NR modem featuring millimeter wave. Netgear's Nighthawk Cable Telephony Modem will be the first-to-market retail DOCSIS 3.1 cable modem with two built-in telephone jacks, allowing landlines to be connected to the cable network. Being made available with support for Xfinity Voice, it will include support for Multi-Gig high-performance Internet plans, both current and in the future. At present, it isn't clear how useful that the device will be in the short-term. Network availability in the U.S. is profoundly limited, is expensive, and has significant data transfer caps. Pricing and availability were not disclosed for either Nighthawk device. What's with those aspect ratios for the smart art frames? They chose "1920 x 1080 full HD resolution" which is common for video (16:9), but not so common for actual cameras (3:2). Looks too skinny. "The Nighthawk 5G Mobile Hotspot, ... will be the "world's first standards-based millimeter wave mobile 5G device." Could this be the router of the future? Why run both Cable and 5G to your house if most of your devices are running on 5G anyway? In fact, why even use a router/hotspot to convert to WiFi? Why not just use 5G both inside and outside of the house instead of having mesh routers on every floor you have 5G replicators? I suspect that the answers to those questions will lie more in what the carriers decide to let us have than in the technology. In my neighborhood we have telephone poles about every 5-6 houses (about every 100 yards or so). I can see the wireless carriers stringing cable to each pole and then broadcasting the 5G from the pole to the devices both inside and outside of homes -- and cable would only be strung to structures where there was some particularly large need for speed or capacity. Because those are standard LCD screen sizes, and a major goal stated is lowering the cost. The bigger problem is that they chose HD and not 4K. I’d also suggest not going OLED here is a problem too, but then that wouldn’t exactly keep the cost down. 4K is a must for a wall frame that size, since you’ll be able to see the individual pixels in most cases. Until these screens go 4K OLED, digital frames are really not going to be a suitable substitute for a photo display in a home. Of course OLED with its potential burn-in issues is likely not the best choice to display a static photo for hours at a ime. i do wonder with the number of 16:9 screens populating commercial businesses whether that will start to shape people’s expectations about what constitutes normal portrait photographic ratios? I went to a major photo exhibition recently that mixed digital displays throughout the museum with physical prints, and all of the digital displays were 16:9 displays, either landscape or portrait. There's definitely more than just the panel that goes into these products, but a starting price of $595 seems pretty steep for something based on a 1920x1080 panel. I totally agree that 4K would be MUCH better. Might as well go for HDR as well. OLED would be a bad choice. Even the newest OLED panels suffer from screen burn in. I'm curious how the new micro-LED panels will compare to OLED. I have a basic 800x600 digital frame in my kitchen. I specifically chose that model due to the more "normal" aspect ratio. I guess with so many pictures being taken with phones these days (gosh I sound old fashioned), the wider aspect ratio may eventually be the new normal.